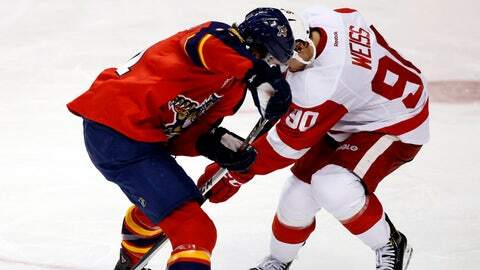 Jonathan Huberdeau (left) and the Panthers have beaten the Red Wings twice already this season. The Detroit Red Wings were showing signs of a turnaround before the offensive struggles that have plagued them of late resurfaced as they were being shut out in their last game. Perhaps the return of their leading scorer will help them finally put those problems in the past. Henrik Zetterberg is expected to play as the Wings face the Florida Panthers on Saturday night in the opener of an eight-game stretch away from Joe Louis Arena. Recent call-ups Drew Shore and Alex Petrovic are hoping to make their presence felt early. Injury-plagued Detroit (17-13-9) had won two in a row since a six-game losing streak, scoring eight goals in those victories after totaling seven during the skid. The Wings couldn’t keep it up Monday, however, falling 3-0 to the New York Islanders. Zetterberg has been the biggest loss due to injury, as he’s missed 11 games with a herniated disk in his back. Despite the extended absence, he still leads the team with 30 points in 28 games, and also tops Detroit at plus-12. He indicated Friday that he plans to be back in the lineup Saturday. "It’s been a long time. How many games has he missed? Lots. I just know we need him back," coach Mike Babcock told the Red Wings’ official website. "I just know we have 19 games to the Olympic break and we need some traction. We need traction in our work ethic, in our in our preparation, in our consistency, in our specialty teams, in our injury situation, we just flat out need traction." Zetterberg hasn’t played a home game since Nov. 27, and it will be Jan. 18 at the earliest until he competes at Joe Louis Arena again. Detroit plays seven of its next eight on the road, with its only "home" contest being the Winter Classic against Toronto at Michigan Stadium on New Year’s Day. The Wings can only hope that Zetterberg’s dynamic game can help them avoid any more sluggish efforts such as the one against the struggling Islanders. Zetterberg isn’t the only addition they’ll have Saturday, it appears. Winger Justin Abdelkader is expected to be back after missing five games due to a concussion, and center Darren Helm could return for the first time since Dec. 4 due to a shoulder injury. "I just want to play. It’s painful. I just need to get out of this bad luck of injuries and get ‘er going," said Helm, who has seven goals in 15 games. "I’m skating, I’m shooting, doing a lot of good things. 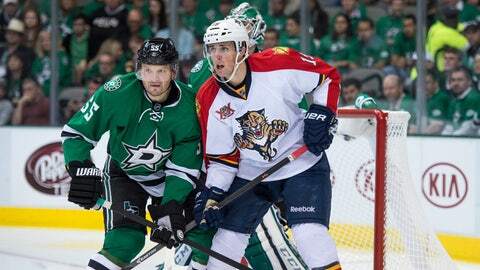 There’s a couple things I don’t know if I can handle, the hard physical grind of an NHL game." The news isn’t as positive for defenseman Jonathan Ericsson, who is expected to miss three to five weeks after suffering a few fractured ribs against the Islanders. Goaltender Jimmy Howard is hoping to return Monday from his MCL injury, so either Jonas Gustavsson – dealing with a groin injury himself – or third-stringer Petr Mrazek will start Saturday. Detroit will face a fellow offensively challenged club in Florida (14-19-5), which has totaled three goals in losing its last two games after recording 15 during a five-game winning streak. The Panthers had won seven of eight before giving up 11 goals in the back-to-back defeats, the most recent a 6-1 rout against Tampa Bay on Monday. Scott Clemmensen had given up six goals in four starts filling in for the injured Tim Thomas before allowing all six on 36 shots Monday. "I’ve always said, to be successful you have to have a bad memory and hopefully just use these next three days to kind of recharge a little bit," Clemmensen told the team’s official website. "Hopefully that will do us well coming back for (four) more home games here after Christmas." The Panthers have won both meetings with the Wings this season, 2-1 at Detroit on Dec. 7 and 3-2 in a shootout at Florida on Dec. 10.